BE THE FIRST TO GET YOUR HANDS ON A FRINGE PROGRAM! Experience what it’s like to have a beer in one hand and a FRINGE program in the other, for the first time this summer. 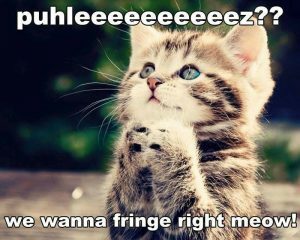 It’s never too early to start planning YOUR FRINGE. See what shows and events are to come and meet the artists that will make it all possible! https://montrealfringe.ca/wp-content/uploads/header-trans1920-1030x278.png 0 0 Amy Blackmore https://montrealfringe.ca/wp-content/uploads/header-trans1920-1030x278.png Amy Blackmore2018-04-18 18:56:032018-05-31 16:11:26#Fringebuzz Program Launch! #Fringebuzz Live Auction results and launch of the Online Auction! Tickets are on sale!